Divest Dartmouth members and other students gather outside of Parkhurst Hall before College President Phil Hanlon's open office hours. On Tuesday, approximately 20 students gathered at College President Phil Hanlon’s open office hours to demonstrate support for fossil fuel divestment. 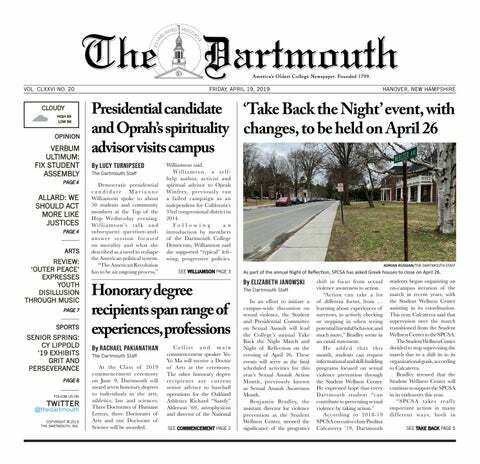 In an email publicizing the demonstration, members of Divest Dartmouth wrote that while they have attended Hanlon’s office hours multiple times this year, each time, they left Parkhurst Hall “frustrated with [Hanlon’s] lack of transparency and obvious stalling tactics.” As a result, the group made efforts to recruit “new faces” in order to show Hanlon the extent of student body support of fossil fuel divestment as a move toward climate justice, according to the email. “It’s clear that this campus does, even just passively, agree with what we’re doing … the literature supports that climate change is real and that we have to do something about it and that tackling this issue from all different sides is important, and divestment is just one tool in the arsenal,” Divest Dartmouth member Ches Gundrum ’17 said. Another Divest Dartmouth member, Catherine Rocchi ’19, said that although there are existing lines of communication between students and the administration regarding fossil fuel divestment, there has been limited success in seeing a response to outreach as well as being given a firm deadline for a vote within the Board of Trustees for divestment. She said that in addition to the results of the April 2016 report on divestment by Thayer School of Engineering professor Mark Borsuk, Katie Zhang ’16 and Kasidet Trerayapiwat Th’16, she and other students wanted to express strong support in favor of divestment. According to Divest Dartmouth documents, the group highlighted the report in the session, in addition to other topics such as when the College could expect a vote from the Board of Trustees on divestment and whether Hanlon is concerned with the possibility that the College could be the last of its peer institutions to divest. According to Divest Dartmouth website, Yale University and Columbia University have committed to partial divestment, while Harvard University is working toward divestment after public sit-ins. A problem that Eleanor Dowd ’19 sees with the office hours format, however, is that what is said in the meetings is “off the record.” She said that this makes it difficult to hold Hanlon accountable for his promises. In an interview after the meeting, Gundrum said that Hanlon has a crucial role in bringing the vote to the Board of Trustees. Brandon Nye ’20 added that one of the concerns Hanlon had expressed in the past was the potential for the College to lose credibility in its research in regard to climate change if it were to divest. Nye said that he asked Hanlon whether there had been a detriment to the credibility on the College’s research since the College divested in tobacco. Nye said that he asked this because the academic research is clear — fossil fuels lead to climate change — and that divestment is just expressing what already been confirmed by research. Gundrum said that because the College has “educated” and “unbiased” information regarding the role fossil fuels play in climate change from the report, she wonders what the “true motivations” behind the administration’s decision not to divest are, as the administration has “every piece of information they need” in order to make a decision. Gundrum also noted that students at peer institutions have participated in sit-ins and other “more extreme” forms of showing support for divestment, saying that last year’s rally was “complicit” with the school’s rules and that more radical efforts have not been made at the College recently. “We have yet to take our steps outside those boundaries and to push the school, at least in a really long time, so maybe that’s what will be happening in the future,” Gundrum said. Alex Miller ’20 said the College’s ostensible attitude toward the environment did not meet his expectations.